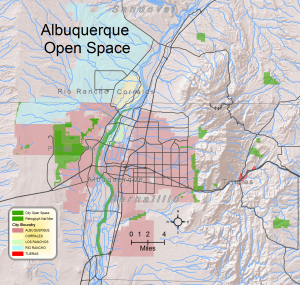 The City of Albuquerque Open Space Division (OSD) manages nearly 30,000 acres to preserve, conserve, educate and enjoy. While much of this resource lies within the city limits or borders on the city limits, there are some remote locations, beyond the urban setting. The above link to OSD will provide more information on specific properties. OSD has also published a guide to many of the open space locations. The guide, “25 Outstanding Open Space Destinations” is available at local book stores and outdoor sporting goods retailers.